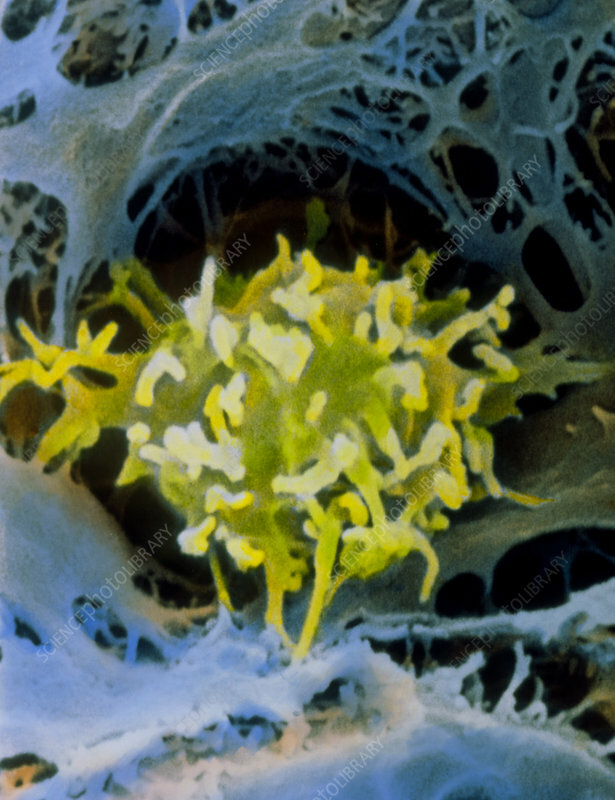 Macrophage in liver: false-colour scanning electron micrograph (SEM) of a reticuloendothelial cell (a type of macrophage) within a fenestrated capillary of the liver (blue). The ruffled surface extensions are typical of wandering macrophages. The reticuloendothelial system (RES) consists of a community of cells involved in phagocytosis and includes circulating monocytes and macrophages. RES cells defend the body from microbial infection and remove worn out red blood cells from circulation. The RES is also called the mononuclear phagocyte system (MPS). Magnification: x3350 at 6x7cm size.